Brother carp visited Brocard Large this summer and took some incredible aerial footage to give you a real feel for this 39-acre French carp fishing venue. Take a look! Brocard Large is situated within picturesque woodlands in the Champagne region of France, created and run by the prominent fish farming Bachelier family. The complex consists of 2 lakes, Brocard Large and Small. The larger of the two Brocard Lakes is picturesque and abundant with wildlife. It holds a good stock of carp to high 50’s and 15 sizeable catfish. You have the choice of several double swims and one that can be booked as a single or a double. 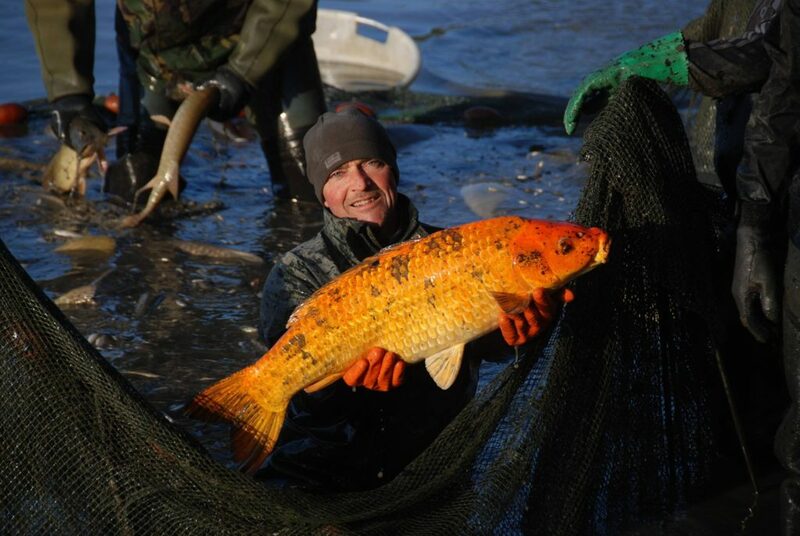 If you are looking for a serious water that contains a large average size of carp in natural surroundings, then this could be the one for you – carp fishing France in beautiful surroundings. Here is a short aerial video of Brocard Large during the drain down and netting this November. 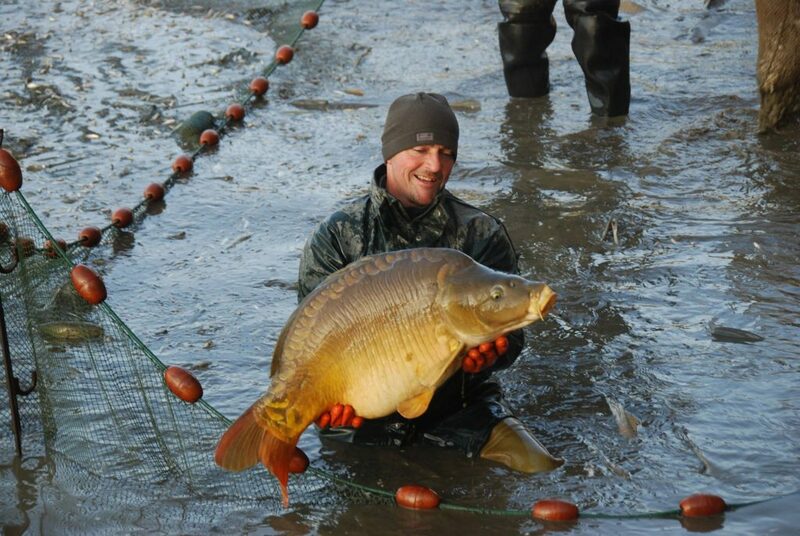 We also managed to get some great photos as the carp were returned to the lake. 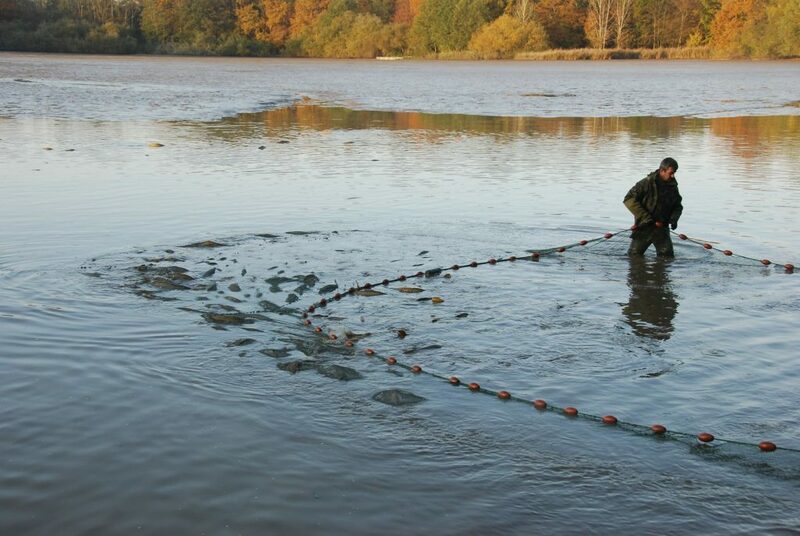 39 acre Brocard Large is drained and netted each year, small roach and zander are removed and the carp stock safely passed back over the net. This takes place once the lake has closed for the winter. We found it interesting to get such a clear view of the old river bed that runs through the lake. The lake is relatively shallow and the bed is mainly made up of clay with a covering of silt. You can see photos of the lake once filled with water here. Biggest Fish on the Smallest Rod! 5 year old Oscar Castle manages to bank a new PB carp at Mas Bas Lotus Lake after his hired rod explodes (bang!) during the fight! 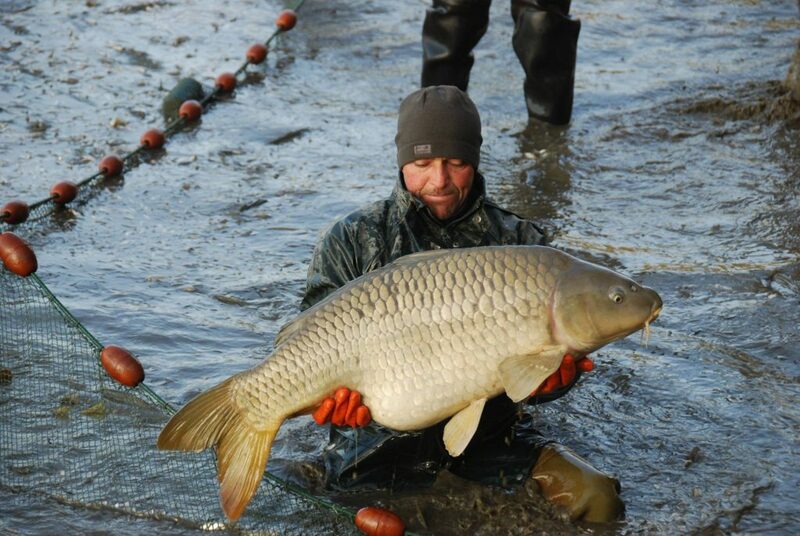 Excellent accommodation, swimming pool & specimen carp fishing – you can’t help but fall in love with this venue. The cottage can sleep up to seven and the lake will comfortably take two anglers. 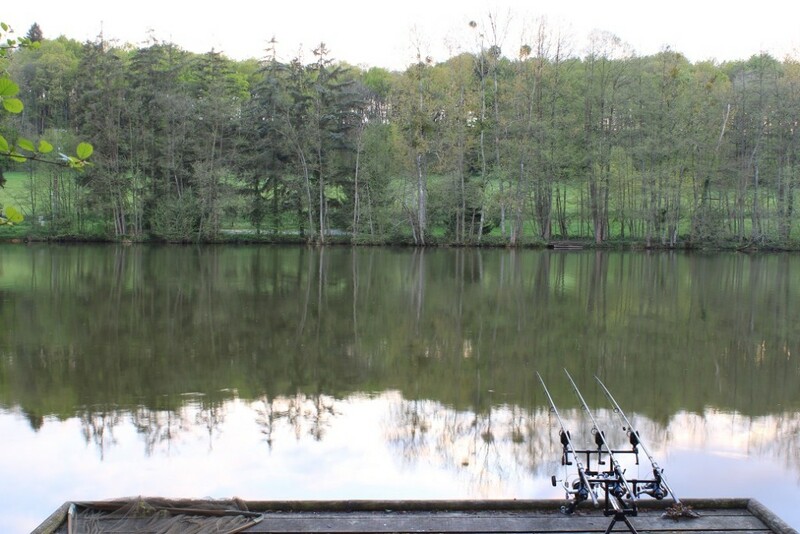 Malvoisine is a 17 acre carp lake, 3.5 hours from Caen ferry. Suitable for up to 10 anglers, you fish sociably from a two acre “island,” reached via a causeway from the bank. 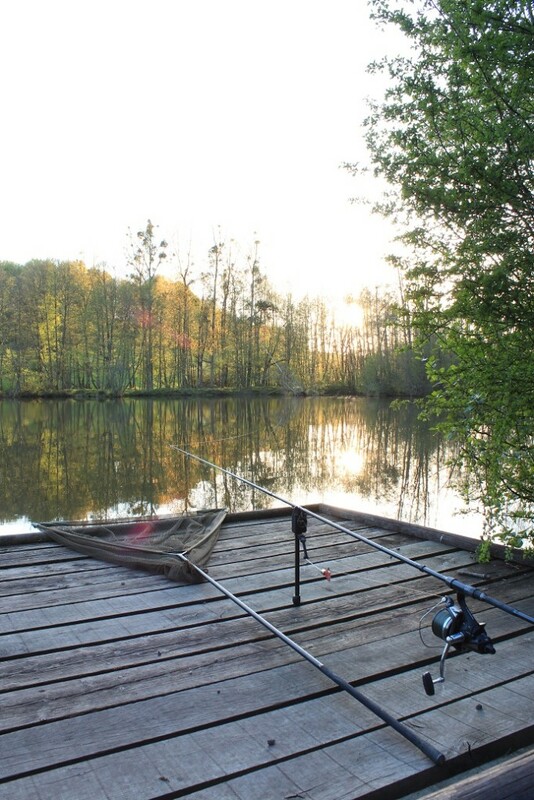 The fact that you can bivvy up together means there is no need to reel your rods in for meals with your mates. Ideal for big groups. Having had a fantastic week’s fishing at La Fonte with my brother and fellow Angling Lines field tester Matt, we felt it we would share our views on the best way to approach the fishing, in order to maximise your catch rate. The fishing at La Fonte is primarily focused on the three main pegs on the cabin side of the lake. 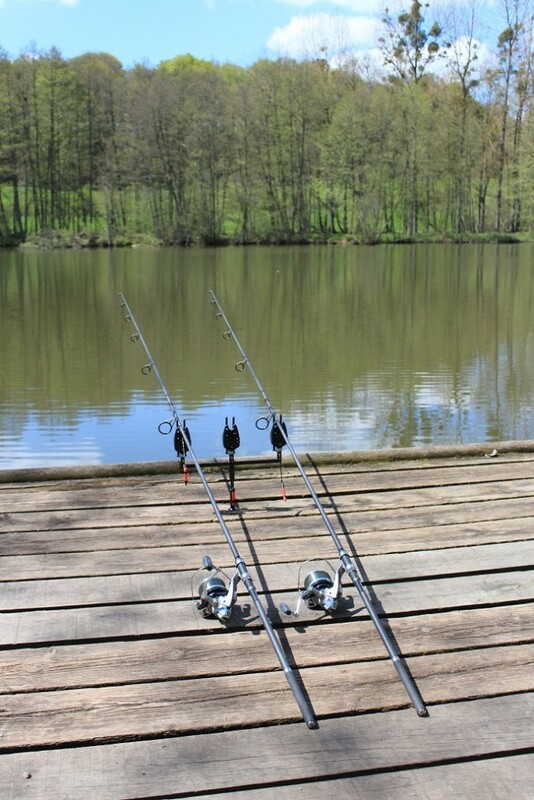 These are all double swims and offer a variety of fishing situations. However the bulk of our 62 fish catch came from tight to the far margin, as the carp have clearly become accustomed to anglers employing bait boat tactics to position their rigs close to the marginal structure on the far side. It is worth noting there are a couple of swims with wooden platforms on the far side but you are not allowed to fish from these currently. Inevitably the Dam wall is the defining feature of this swim and offers the deepest water in the lake. It’s depths go down to around 12ft in places so it’s not hard to imagine that this will be a major fish holding spot. Be warned though that the very edge of the dam wall does hold some severe snags and structure in places so it’s vital to have a walk around in advance of positioning a rig on any spots and have a look and a feel about with a landing net handle to ensure you’re not dropping a rig into something that will inevitably cause a fish to be snagged on the take. Standing and observing the dam wall from the first swim it’s easy to pick out the main features, the overflow grill to the right, trees dotted along the length of the dam and so on. These are obvious starting points and Matt found that using predominantly boilies with a pop up fished over the top scored him very well. This was the area with the higher average size of fish, so if it’s the bigger ones you’re after then this spot is for you. The mid water didn’t really produce in this swim, despite seeing a regular flow of bait being applied during the week. It could have been down to the lack of angling pressure as there were only two of us fishing, so perhaps with a group of six anglers this would force the fish into open water. I chose to use this swim as my main area for the week and initially started with a rod in the near margin, one in mid water and the third tight to the far bank. Over the course of the week it became clear that the far margin was the main spot to target as all of my runs came from this area. Looking across to the far margin there are some gaps in the bank with little channels that the fish like to hold in. A walk around to the far side and some stealthy observation will reveal that the fish do like to shelter in these areas, so to maximise success it is necessary to fish close to these areas. It is within casting distance and as I don’t have a bait boat this was how I fished to this area but clearly a bait boat would be an advantage. Be warned however that margins are inevitably snaggy so do not be tempted to fish bang up to the tree line as you’ll not only lose a high percentage of runs but you could place the safety of the carp at risk and no capture is worth the risk in my eyes. I found that scattering bottom baits with a throwing stick to be a good method as I was able to spread baits across the marginal patrol route and ensure the fish were kept hunting for the individual morsels. Fishing tight lines and locked up reels is a must and it’s important to get on the rods as soon as any indication occurs. This was by far the most prolific spot during our week as sport came thick and fast at times. We chose to fish this swim during the day, with Matt using two rods and just the one rod for me as I had to concentrate on filming and photography. On more than one occasion we experienced double hook-ups so be prepared with retainer slings and a few landing nets as you will be kept very busy. A glance across to the far side will reveal the obvious spots to target. Directly opposite the swim is a pair of fallen trees that have formed a V-shape out into the lake. The fish love this area and could be seen crashing and rolling with regularity throughout the day. This is the prime holding spot and Matt was catching up to 10 fish in an afternoon using pop-ups fished over a bed of bottom baits scattered with the throwing stick. A word of warning though. Do not be tempted to fish into the back of this snag, as it could be disastrous for the fish. We were granted permission to take the boat out to look before we cast out and it revealed some severe snags, sunken branches and all manner of obstacles that would tether a fish in seconds. In reality you don’t need to fish too tight to the trees in this spot and Matt was having more luck fishing around five or six yards off the line between the tips of the two fallen trees. The biggest fish of the week, an immaculate 35lb common, was caught fishing away from the snag so it’s worth dropping a little shorter to see if the bigger, more wary fish, prefer to feed where you might not expect them to. It is imperative that you fish next to your rods, have the lines locked up and present your rig so that the lead ejects on the take every time and hit every indication immediately. If not the fish will snag you in moments and not only will you lose your end tackle but the fish’s welfare is at stake. If you do fish this swim during the night then it would be our advice to fish further back from the snag, say 10-15 yards away and keep your rods locked up. 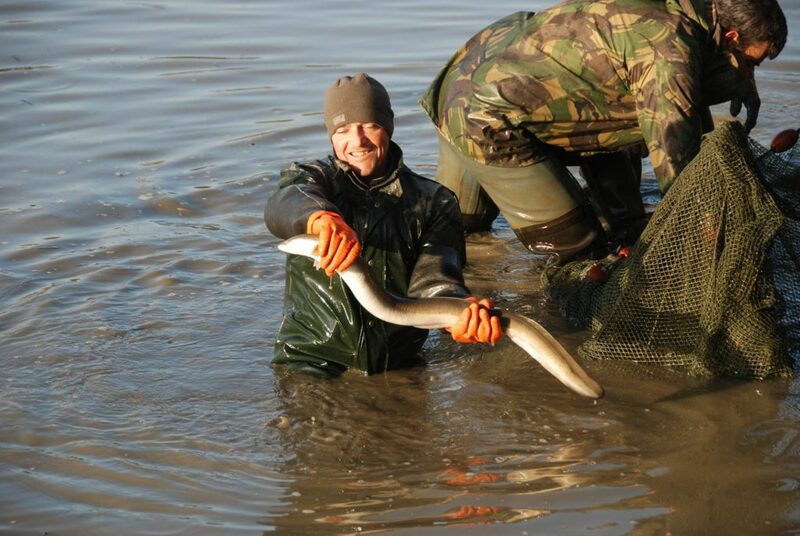 The fish will venture out in the darker hours so your catch rate will not be hampered. In fact, be prepared for a sleepless night as I could hear dozens of fish crashing in this area from my main swim during the hours of darkness. There are options in this swim to the right-hand side looking towards the island and again these proved to be very fruitful. The same rules apply here as with the fallen tree. 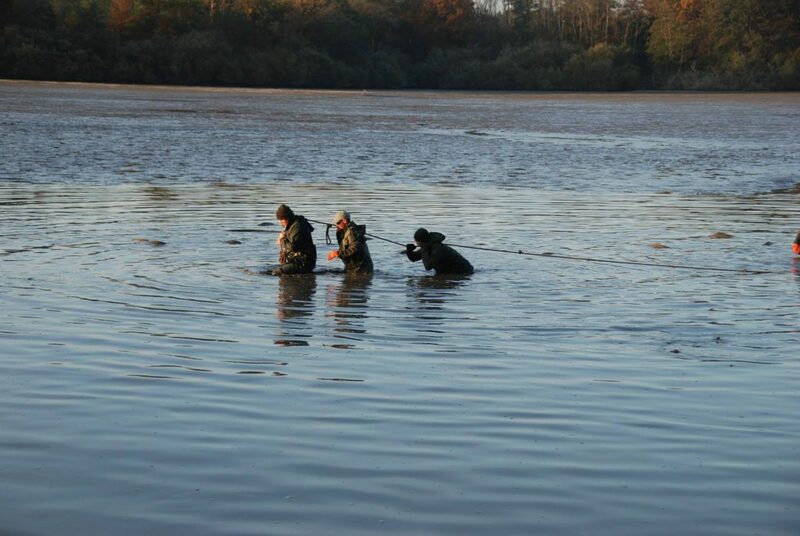 It is very shallow, around 18 inches in places and is dotted with tangles of tree roots and branches so don’t be tempted to fish touch tight to marginal cover. I fished with a very standard lead clip set up and had the tail rubber just lightly nipped onto the clip so the lead ejected on the take. The lake is predominantly silty with the odd hard spot so it’s always worth trying to find them, but I wouldn’t worry if you can’t as the vast majority of the lake bed is covered in silt so the fish are well used to feeding in it. These fish are boilie eaters and will respond to a good spread of bait, but similarly if you do prefer to use particles they will be successful. Just ensure they are properly prepared before your trip. I used around 15kg of boilies over a course of the week, preferring to adopt a little and often approach. 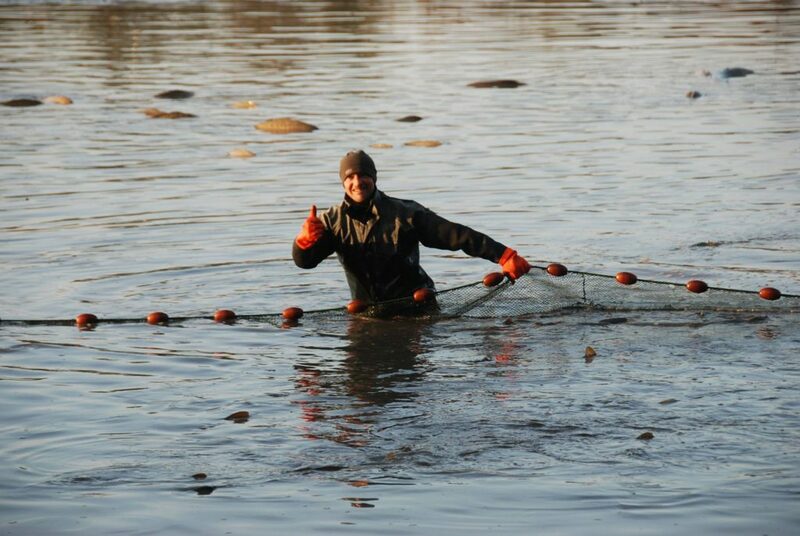 Matt did experiment with a heavy bed of bait on one or two occasions which did catch but our advice would be to start with a moderate amount and build the swim as the catches start to come. It’s a well used phrase that you can always put it in but you can’t take it out and this certainly applies here. It goes without saying that good quality bait will score well and we used our ever reliable Sticky Baits Vortex+ in a mixture of 16 & 20mm as we like to keep the carp guessing and it gives us some flexibility on hook baits should they shy away from one particular size bait. So there you have it, our thoughts on the fishing at this awesome lake! Hopefully that will give you a good head start on your preparation for your week at La Fonte and I’m sure that with a considered and careful approach you’ll be banking lots of hard fighting French carp in no time. 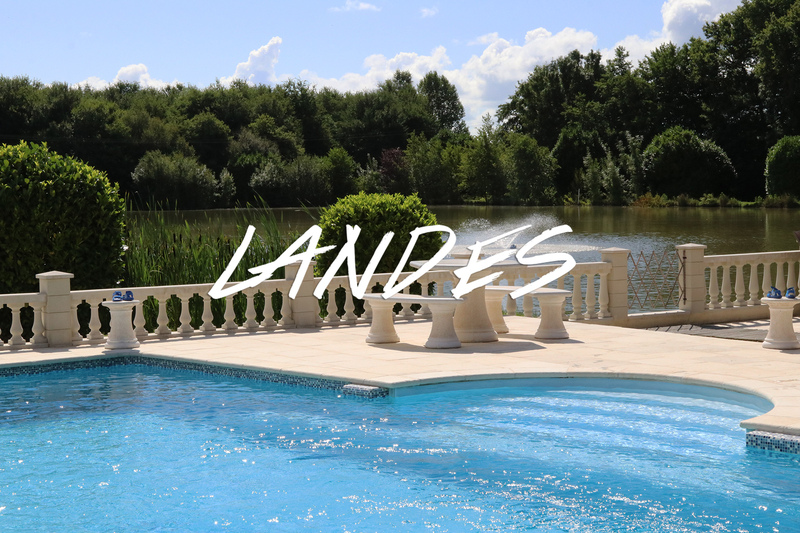 The venue video is here for our latest lake, La Fonte. 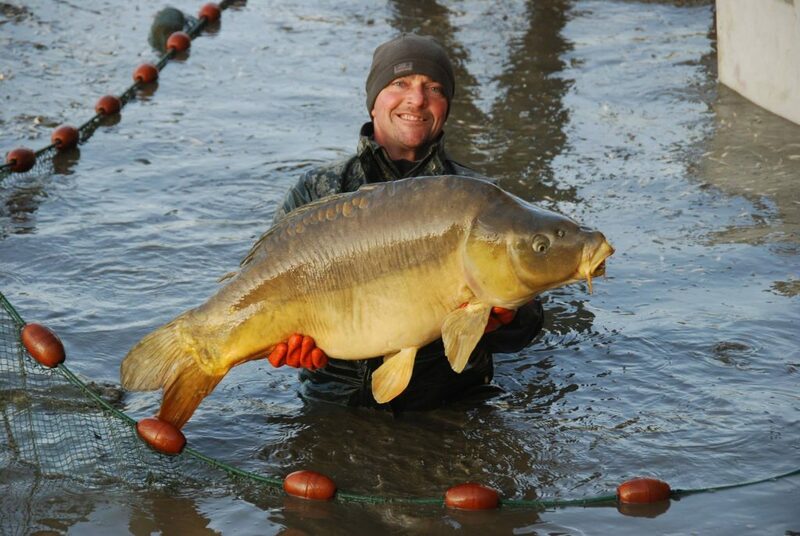 Mike and Matt Linstead had an incredible run of carp at the 7 acre lake in Normandy, France. 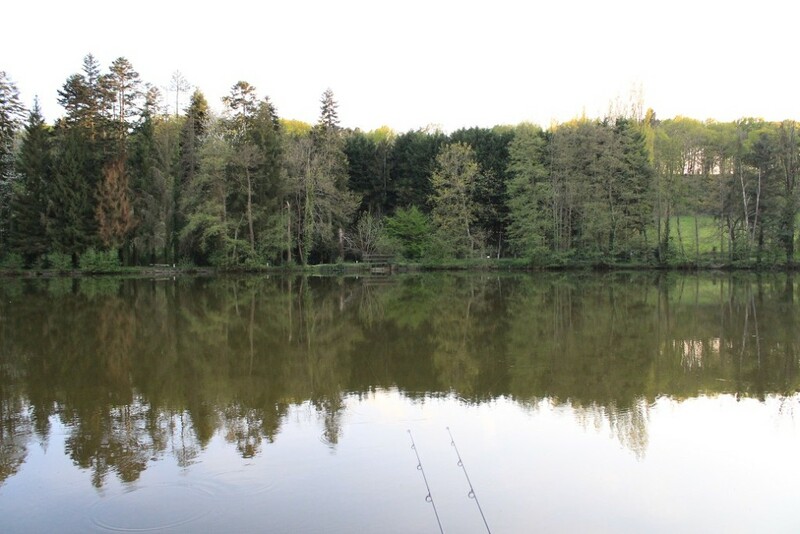 Just three and a half hours drive from Calais, this lake is best described as a runs water and ideal for 4 anglers to share exclusively (5/6 at a push). Facilities here are excellent, there’s a cabin with full kitchen, BBQ and social area. 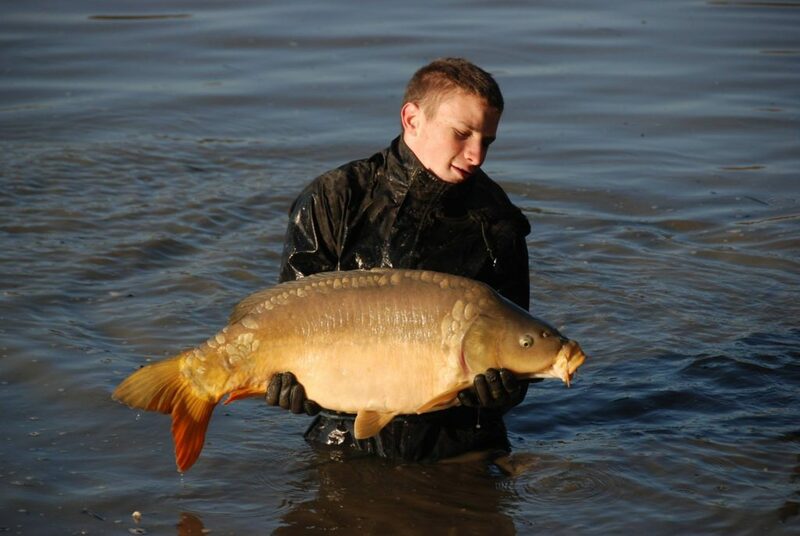 Tom Robson and Rowan Charnick had a very successful winter carp fishing session at Old Oaks this February. They had carp on the bank to 55b including 2 x 50s, 10 x 40s, 6 x 30s, 2 x 20s and 1 x 10. 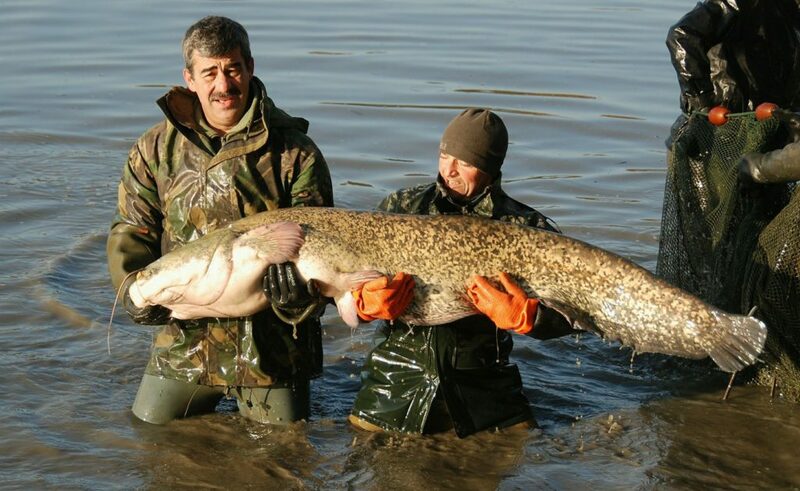 An impressive average weight of 39.8lb. A fantastic session diary from Tom Robson of On The Bank Live, filmed over a week at Old Oaks in October 2015. The week included 4 x 50s, 8 x 40s, 9 x 30s and 1 x 10, with an average weight of 41.8lb.